I haven't participated in a meme since the friday five and blogger idol, but since I have been involuntarily tagged, then I guess that I will participate. The idea behind this one is that, when tagged, you choose 5 occupations (or more) from the list below and complete the sentence with it describing what you would do as a member of that profession. If you have more occupations to add, you add them at the bottom following the "If I could be..." format. After your done, you get to go and tag 3 other people. Add a trackback to the one that tagged you as well as a trackback to Ogre's origional post. If I could be a pirate, I could say, "argh!" and not have to feel odd about it. If I could be a writer, I could start a blog that people would actually go to daily and read and be interested, and leave 100 comments a day! If I could be a computer programmer, I would work for Google. Cause, they da coolest! If I could be a police officer, I would always try to be there when you wanted me around. You know how it goes. Haven't you ever said, "where's a police officer when you need him?!?" If I could be a llama rider, I would most defintely ride llamas. Emily @ Audience of One. Right in line with what I posted yesterday, here is a great article called The Gospel vs. Religion. It is worth a read, go and check it out. I normally don't get involved in internet debates, but the last couple of weeks I have been participating in a couple of debates. One of them started on a Post by Tim Samoff. It is an interesting topic, and one that I think is of great importance. I would like to encourage you to read there and see what you think. From that post, I was inspired to get involved in a forum. On this forum, I started a new topic called, Weak Theology. You will have to read it in order to understand what it is about. There have been several good responses to the initial topic. I haven't started debating these things to try to earn enemies. In fact, most of these blogs I read on a daily basis, and have been reading for over a year now. I enjoy hearing what these people have to say. on and to trust that God is big enough to answer those questions." Yes! God is big enough to answer these questions! But He DID answer them. We call it the Bible. I am all for questioning things. In fact, I have lost a couple of friendships because I have been willing to listen and interact with people who believe differently than I do. I even had one guy decide that he couldn't fellowship with me anymore because I was so liberal. But I can look back, and in every case, whether it was the conservative calling me a liberal or the liberal calling me a conservative, it was always because I was standing on the side of scripture. And that is right where I want to be. Here are some words used throughout the books of Psalms and Proverbs referring to the Bible, the Word of God. As you read through these books, consider these definitions*. The word of God is an amazing thing. Something that I hope I will never cease to be amazed with. Wonderful things out of Your Law. I am at school right now. I am sitting at my desk while my students are taking a standardized test. 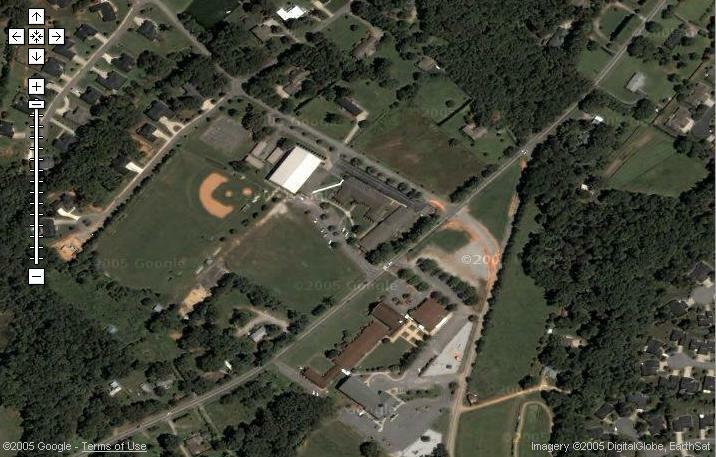 Here is the satellite image of my school, thanks to Google Maps. I don't know why I am putting this on here, except that a satellite image of anything is a little cool. When you search for something, it gives both Yahoo! 's results and Google's results. Here are a couple of blog tools. Simple Code - If you want to enter an example of code into your blog post, but everytime you try, it ends up looking like what the code would do... Then try this site. I used this tool a few post ago, look at it here. Blogger Hacks - This is on the Blogger site. If you are using Blogger for your blog, you might find one of your questions answered here. Thanks to Rodney Olsen's Skype™ posts, here and here, I have been using Skype™. I even had the opportunity to talk to Rodney using Skype™. (It isn't everyday that I get to talk to a real live Australian!) But I will say that there was some controversy over who had the accent. He even mentioned my name during his radio broadcast, on 98.5 Sonshine FM (an Australian radio station!) That is right, ladies and gents -- Matt Harmless' name has been mentioned on the other side of the globe! HotRecorder™ is a new program that you can use to record Skype™ conversations. I have even seen some articles about how it can be use to create something called a podcast. But because of Skype™ some people are calling them Skypecasts. There is only one problem that I face while using Skype™... Nobody I know is using it! Life happens, doesn't it? It doesn't matter what you do or who you are, life just keeps rolling. Whether you respond well to life, or if every little bump in the road throws you into a series of convulsions -- life just keeps happening. And the situations that we find ourselves in can be very difficult. We are surrounded by these... these... People! They are everywhere, and none of them treat us the exact way that we want to be treated, and most of them are just plain old selfish! Whether they are bosses, co-workers, family members, students, teachers, or neighbors... even when there are a few good ones, there are plenty of them that are treating us wrong. But as I look to the Word of God, I find great hope in these circumstances. All things! That pretty much covers it. Whether it be a broken down car, a sick loved one, or a math teacher that you don't like so much, All of these Things God is working for good! This truth transforms the perspective. No longer are these things in our lives random misfortunes, they are tools that the Master is going to use for our own good. And who knows what is best that is good besides the creator of the universe? Trust Him, He knows what He is doing! "If we could only look upon a difficult crisis as an occasion of bringing out, on our behalf, the sufficiency of divine grace, it would enable us to preserve the balance of our souls and to glorify God, even in the deepest waters." And what is this good that God is working on? It is to conform you to the image of Christ himself. He is working to make you more like Jesus. Some people would call Christ above the normal. In our state of mind, it might be easy to think that. But while Christ was on this earth, he lived what man should have been (Romans 5:12-21). He defined normal. The rest of us have fallen below the norm -- far below! Some people water down Romans 8:28-29 so much that they would have it to mean that God is going to fix everything that we mess up. Or that everything is going to "work out." But it is so much more than that. I would like to encourage you to alter your perspective today. Have an eternal mindset today. When these things happen, remember that God is working! And His work is to make you more like what you were meant to be -- a child of God! Since I moved to the South last summer, I have grown to love it more and more. The mild winter, the early spring, the sweet tea, the sweet southern accent... But today I found something that in my 31 years of living up north, I have never found. It was crawling in one of my son's toys, in the toy box. I caught it in a little tupperware container, just so I could study the markings. The picture you see to the right isn't the actual spider I saw, but the one I have looks exactly like this one. Now, there aren't many things that freak me out. I don't mind heights. Big dogs are only a little scary. Roller coasters, no problem. But I can't stand little things that bite. And to think that there was one in my children's sand box! They say that the bite of a black widow spider won't actually kill you, but how is that any consolation?!? The fact that they have to say that it won't kill you is enough to freak me out! Well the southern living... I love it, I just hope that it doesn't come back to bite me. Today is Friday, April 15th, 2005... Do you know where your taxes are? Anyone who listens to the word but does not do what it says is like a man who looks at his face in a mirror and, after looking at himself, goes away and immediately forgets what he looks like. Imagine a guy getting up in the morning and going to the mirror, and spotting this huge, swollen, ripe blemish on his forehead. Right away, he knows that something needs to be done with this thing. It is so big that while he is looking in the mirror, it is the only thing that he notices about himself. He can't take his eyes off of it. It is so bad that he ponders canceling all of his appointments until it had been dealt with. He begins thinking of different surgeries that he could perform on himself to get rid of it. He'll do anything! He thinks to himself, "how in the world could I ever face another human being while this thing is on my face?!? I'll be nicknamed the unicorn!" Then he walks away from the mirror, gets dressed and goes to work. How can this be, you wonder? Well, how can it be that we do the exact same thing? We go to church or we are hanging out with one of our Christian friends and they start talking about spiritual stuff or maybe, we have even sat down to read our Bible and then it happens. We get a glimpse of ourselves. The word of God, with its soul-piercing ability has cut down deep and we have seen ourselves, the same way a person might look into a mirror. We don't like what is there. It isn't good. There are some things that need to change, and they are far worse than any blemish that you might have found growing on your face during those awkward years. But instead of dealing with the problem, we walk away and forget all about it. The really scary thing that is found in this passage is the warning. If you merely listen to the word, and don't do what it says, you will deceive yourself. I don't think that there is anything that I have found to be more alarming than the possibility of self-deception. The extreme of self-deception is found in Matthew 7, when there are people who get to the judgment, and are genuinely surprised at where they are heading. "Then I will tell them plainly, 'I never knew you. Away from me, you evildoers!'" Notice the surprise of these people. Notice the word, many. Also notice the emphasis on doing, "...only he who does the will of my Father..." Of all of the shocks to receive in your existence, this is the one not to get! This is why every time we go to the scripture, we need to seek how we can apply it... right now! Don't wait, don't hesitate! As it says in Hebrews 3:7 and 3:15, "Today, if you hear his voice, do not harden your hearts..."
If you are hearing and not doing, you will be deceived. And according to I Timothy 4:2, eventually you will stop feeling so bad about those things that need to change. Your conscience will become seared, and you will no longer feel those pricks. Eventually you will start to feel pretty good about yourself (to a degree). But in reality you will be so far from the Savior whose image you were meant to conform to. "When a man is getting worse, he understands his own badness less and less. A moderately bad man knows he is not very good: a thoroughly bad man thinks he is all right." If you have read these words and they hit a little too close to home, then start today. No... I didn't get promoted. At least not yet! I would like you to promote me though. Add a button to your blog! Copy and paste the following code into your blog. Read about the Let Me Not Wander blog here. Last year I was teaching a Bible class at a highschool. The class was composed of sophmores and juniors, and we were discussing the importance of being in the word on a daily basis. If you are ever going to hope to change, one of the main ingredients is to be in the word. After spending some time talking about this great importance, one of my students approached me and said, "I really want to read my Bible everyday, and I always start with such excitement and energy, but no matter how hard I try, I always fail. I will read the Bible for about a week, and then it just fizzles out." I think that alot of us have dealed with the exact same thing. We know what the right thing to do is, but when things get busy, Bible reading is usually the first thing to go. Well, after talking to this student for awhile, and several others with the same problem, I came up with a plan. It isn't a permanent plan, but a plan to get started. A method to get yourself reading some of the Bible everyday. In that Bible class I told them to print off a passage of scripture, tape it up in their locker, and read a new verse every day. I know that it isn't much, but it is better than nothing. And hopefully it will help build a habit, a habit that will grow. From that idea, I came up with an extension of that. I started a blog called, Let Me Not Wander. In this blog, I will simply post a new verse each day. I will try to keep my comments on that verse to a minimum, because I want this to be a place that students or others could go to on a daily basis and get a snippet of the word of God. I was thinking that there are several students that I know that are never in the word, but they are on the internet every day. So why not create a resource for them? Please visit this new blog, and add some commentary of your own. I would like to direct you to a few blogs that I have found in the last month or so, that I think make some really good reading. Alright, I did it. I joined the sypers of the world. I have tried it, and it really does work. All you need is an internet connection, speakers and a microphone. The last few months have been very busy months. In March I went to Washington DC. Another great experience, and one I was able to share with my wife. But these trips were beginning to wear on me. Right after the Washington trip, spring break came along. Normally Spring Break is a break... But with family visiting, I don't think that I actually spent much time sitting and lounging. And I definitely did not spend any time getting caught up. And then on April 1st, we went to Carowinds. Both my wife and my oldest son went with me on this trip. It was for the 8th graders, and I was the bus driver (I know, I know, riding in the bus with me is scarier than any roller coaster you could get on). I was just so happy that my son is a roller coaster fanatic. He loved them. He went on every coaster that he could go on. With his height, there were only the three largest ones that he couldn't ride. I have learned a lot, and I have had a lot of fun, but these busy times can be rather stressful and trying on life. I know that I always struggle in these busy times because the first daily task that gets bumped off of my schedule is my Bible reading. I would like to view my Bible reading as essential as eating or drinking, but so many times I just don't. The cares of this present day world spring up and choke it so easily. Well, I am getting back on track this week, and hopefully this will also help the blog to get back on track. Talk to you all later. Thanks for reading. There is a pastor in Michigan who has put out a series of 10 to 15 minute videos. Each one has a one-word title and an excellent message.